Edwin S. Rubenstein is an economist and an adjunct fellow of the Manhattan Institute. He also writes an economics column for National Review. The research for this article was supported by the Brunie Fund for New York Journalism. While Albany’s budget meltdown is grabbing headlines, another statewide crisis is developing at the local level. For even as New York State was spending beyond its means in the boom years of the 1980s, it was also forcing local governments to spend beyond their means through “mandated” programs, designed and required, but not paid for, by the state. As a result, many localities now face fiscal crises made in Albany. New York State imposes an unusually large array of mandates on local governments. A 1978 study prepared for the Advisory Commission on Intergovernmental Relations concluded that New York State imposed more mandates on its local governments than any other state—in 60 of the 77 categories reviewed. California was second with 52; Alabama had the fewest with 11. The average was 35. Using a broader definition of mandates, a formal inventory compiled by the New York State Legislative Commission on Expenditure Review in 1981 found that county governments alone faced 2,632 separate statutory state mandates. Of these mandates, 608 imposed additional costs on county governments. That fact does much to explain one of New York’s great fiscal paradoxes: Most states endure either high state or high local taxes, but New York has both (see Figure 1). And while the state can, however painfully, control its own budget crisis, local governments have lost much of their power to cut the spending that drives their tax needs. Mandates have become a leading tool of fiscal irresponsibility. The mandate power tempts state officials to take credit for expensive social programs, while shifting to local politicians the political heat for tax increases or offsetting service cuts. The fiscal burden caused by state mandates is not trivial. Mandated programs now account for 60 percent of the average county budget, according to a recent survey by the New York State Association of Counties. Of the state’s 57 counties (not counting New York City), 29 responded to a survey by the association asking what proportion of local revenues was spent complying with social service mandates. The responses ranged from 17.5 percent in Steuben County to 75.5 percent in Niagara. School districts, too, feel the sting of state mandates: State-mandated spending accounts for approximately 76 percent of their budgets, according to a recent study by the State Education Department. These figures undoubtedly overstate the marginal cost of state mandates, since even without mandates localities would surely offer some of the services the state now requires. Still, the numbers suggest how far local governance has slipped out of the control of local governments. Mandates range in scope and significance from Medicaid—the most expensive of all—to a host of “nuisance” mandates, such as the limit of 25 cents per page local governments may charge for duplicating public documents under the state’s Freedom of Information Act (see sidebar on page 54). Mandates deny local governments the power to set priorities. In education, for instance, they control everything from class size to the number of fire drills. New York’s public school teachers are paid $38,000 per year on average, or 24 percent more than the national average. Yet since 1986, the $100 million Excellence in Teaching program has required school districts to grant bonuses to teachers without regard to performance or merit. If a local school board believes this money could be better spent, say on books, its hands are tied. * The small upstate town of Altamont was forced to alter its solid waste facility four times during construction and twice after it was finished to comply with Environmental Conservation Department rule changes. * Class size in special education resource rooms is limited to five students, though a 1985 study by a New York City commission found that raising the number to seven would not harm the quality of education. Raising the limit would save $18 million a year in New York City alone, according to the City Office of Management and Budget. * The New York State Local Finance Law prevents localities from issuing zero coupon bonds, entering into letter of credit agreements with banks, issuing variable-rate debt, and employing certain other financial tools that could lower debt service costs by at least $18 million a year in New York City alone, according to a report by the Office of Management and Budget. * The Wicks Law (actually a series of laws enacted in 1912) requires local governments to award three separate contracts—electrical, plumbing, and heating—for public works projects costing more than $50,000. A single contract system could save the state and its local governments more than $400 million, according to the New York State Division of Budget. The Medicaid program alone would establish New York as the nation’s mandate capital. Total statewide Medicaid costs (federal, state, and local) came to $11.9 billion in 1991, with localities footing about 21 percent of the bill, or $2.3 billion. Though Washington mandates a minimal core Medicaid program, the states have a great deal of latitude in setting eligibility rules and deciding how broad a range of services to offer. New York is one of only three states that offer the full gamut of optional services, a state decision for which counties share the burden. New York also provides Medicaid to people on “home relief” (a local version of welfare). The Federal Government does not pay for this option at all, so local governments are stuck with a 50 percent share. In many New York counties Medicaid costs have become the single largest budget item, taking more than 35 percent of revenues in counties such as Jefferson, Ontario, and Otsego. Yet most other states do not require local governments to contribute to Medicaid at all. One particularly onerous mandate, which also provides a good illustration of the perverse incentives of the mandate system, is the rule requiring county governments to provide special education services for handicapped children under the age of five. The Education for All Handicapped Children Act, passed by the U.S. Congress in 1975, required states to provide such services for handicapped children of school age, but not for preschoolers. Congress did, however, provide some funding for states that included preschoolers, and Albany could not resist. By 1989, New York State’s Education of Preschool Handicapped Children program was costing more than $400 million a year, of which the Federal Government contributed a mere $26 million, while the state and the counties split the rest. This program is a textbook example of how not to design public policy. While the state foists half of the federally unreimbursed cost onto counties, it allows them absolutely no say in how the program operates. School districts, not counties, evaluate the children and have the final say on placement, but they provide no money or other resources for the program. Often the districts delegate the responsibility of selecting students to private organizations that provide the services and have a clear financial interest in placing as many children as possible into the program. The state actively recruits children into the preschool program through a network of “Early Childhood Direction Centers” in certain elementary schools. Specially trained personnel conduct PTA talks and parent-training sessions, and also publish newsletters advising parents of the entitlement. By assigning bureaucratic control and financial responsibility to different units of government, the state undercut any possibility of accountability. There are none of the cost controls that a responsible program might have instituted: means tests, sliding fee scales, or limits on the distances children can be transported. Albany forbids counties to impose tighter eligibility standards. The cost of transporting, educating, and counseling these preschoolers, after growing 25 percent per year in recent years, now averages $25,000 per pupil. A program that did not exist until 1975 now consumes $5 million a year in Rensselaer County, according to County Executive John Buono, amounting to 24 percent of local tax revenues. Moreover, counties must pay all such bills up front, then wait up to 15 months for partial reimbursement from the state. The delay, of course, is yet another gimmick in the state’s annual budget-balancing act. One can also see the effects of mandates by looking at government employment figures. Local governments in New York employ a lot of workers. So many, in fact, that Governor Cuomo recently argued that local governments, not the state, are responsible for New York’s high total tax burden. On the surface, he has a case. As of October 1989, New York had 957,000 local government employees. That works out to 479 local government employees per 10,000 population, 30.5 percent more than the national average. From 1980 through 1989, according to Commerce Department data, the number of people employed by local governments increased 18 percent. Last year, the Albany-based Public Policy Institute reports local government employment increased 1.5 percent, or by nearly 16,000 jobs. But much of this increase appears to be driven by state mandates. There are no comprehensive statewide data on the growth of mandated spending or employment during the 1980s. We do know, however, that local government employment has been expanding fastest in just those services with a heavy and growing mandate burden. U.S. Commerce Department data, for example, show that 60 percent of the growth in local government employment between 1980 and 1989 occurred in elementary and secondary education, an area rife with new mandates. Similarly the number of local corrections personnel soared by 108 percent between 1982 and 1989, six times faster than the 18 percent rise in total local government employment. Local jails have come under strict mandates prescribing the number of guards and supervisory personnel for a given population of inmates. * Suffolk County, the most populous county outside New York City, cut discretionary county spending by $45 million in 1991. But mandated spending went up $70 million, according to County Executive Patrick Halpin. The county spent 53 percent of its General Fund on mandated programs in 1991, compared to 44 percent in 1988. * In Monroe County, between 1988 and 1991, 65 new full-time positions were created to deliver mandated social services. The staff of the county jail has increased by 64 within the last year. By contrast, nonmandated local services, including parks, roads, youth programs, libraries, arts agencies, and the Monroe Community College, lost 72 fulltime employees over the same period. * Rensselaer County had twenty fewer full-time employees at the end of February 1991 than it had five years earlier, according to the county’s personnel director. Virtually all cuts occurred in nonmandated programs. The number of janitors and repairmen assigned to public buildings was reduced by 15, but staffing at county nursing homes, subject to state mandates, increased from 402 to 423, and the number of mental health personnel rose from 68 to 79. * Faced with an 82 percent increase in property taxes last year, Ulster County resorted to some drastic cost-cutting moves, which kept the rise to 18.8 percent. Most of the cuts came out of nonmandated programs: Road work was deferred for a year, and bridges (half of which are deficient) were not repaired. Arts programs were cut by one-fourth, a significant cut because Ulster County includes Woodstock, home of the state’s largest concentration of artists outside of New York City. But the most persuasive evidence that mandates are responsible for the growth of local government is drawn from the changing nature of state aid to localities. In 1990 Albany sent $15.5 billion, or two-thirds of the state’s general fund, as aid to local governments. This aid comes in two forms: “unrestricted” aid, which local governments can spend pretty much as they please, and “categorical” aid, which often represents the state’s share of mandated spending programs. Categorical aid often costs localities money because they are required to match (partially or dollar for dollar) the state’s contribution. Most local officials would gladly do without certain categories of aid if the corresponding state mandates were reduced also. For state politicians, however, categorical aid affords an opportunity to make common cause with unions, welfare recipients, caseworkers, and other special interest groups, since Albany can direct the money (along with local matching funds) to programs that benefit favored groups. Changes in the amount of categorical aid provide a rough “proxy” measure for how much of local government spending and employment is being driven by mandates. The 1980s saw a huge rise in categorical state aid, both absolutely and as a proportion of all state aid. From 1980 to 1990, categorical aid increased from $9 billion to $14 billion (in 1990 dollars), an increase of 56 percent in real terms (see Figure 2). During the 1960s and 1970s, categorical aid had actually fallen as a proportion of all state aid. But from 1980 to 1990, categorical aid rose from 81.5 percent of all state aid to more than 90.4 percent. This last figure may seem like a small increase from an already very large base. But as noted before, the state mandates many programs that localities would provide without prompting from the state. These services account for a large proportion of categorical aid. This “given” base of categorical aid would not be expected to change rapidly. In that light, a proportional increase in categorical aid of 8.9 percentage points and real growth of 56 percent in a decade loom quite large, suggesting that the bulge in local government employment is in part the result of exotic, and costly, micromanagement by mandate. Unrestricted aid, by contrast, reduces pressure on the local tax base and reduces the impact of state mandates. But it has little political value to state legislators because they cannot guarantee that it will flow to specific organized constituencies. The proportion of all state aid that was unrestricted fell by nearly half during the Eighties. Unrestricted aid has been capped for most localities since 1987 and was terminated entirely for counties in 1990. Governor Cuomo’s 1992 budget would cut state revenue sharing by about 50 percent for cities and eliminate it entirely for villages and towns. Governor Mario M. Cuomo announced today that his 1991-92 Executive Budget will include aggressive mandate reform measures that would save local governments more than $450 million and school districts in excess of $160 million next year. The Governor also announced his support of local government efforts to save up to $400 million through reform of the Wicks law [discussed above]. What the three-and-a-half-page single-spaced press release failed to mention was that most of the proposed “mandate relief” would actually come in the form of state authorization for a $1 billion increase in local taxes, out of which local governments could close the Fiscal gaps opened up by mandates in the first place. Aside from the disastrous impact of a $1 billion tax increase in the current economic climate, the Governor’s proposal also ignores the fundamental political problem: Local officials would still be stuck with raising revenue for programs they cannot control. At most, the increased taxing authority would slow the decline of nonmandated local services. Some of the Governor’s mandate proposals—procedural and eligibility reforms in AFDC, Medicaid, and preschool special ed—would genuinely reduce costs for localities. But even here there are problems: Most of the Governor’s Medicaid relief proposals—an array of caps, freezes, and reimbursement rate reductions—would simply push costs from state and local government onto hospitals and nursing homes, endangering some already fragile institutions while failing to reduce overall medical costs. Reforming the Wicks law is a good idea, but doing so would require more than the Governor’s nod of approval: It would require a titanic political struggle in the Legislature and with the unions, which the Governor shows no signs of preparing to enter and might not be able to win. The mandate issue is not new. 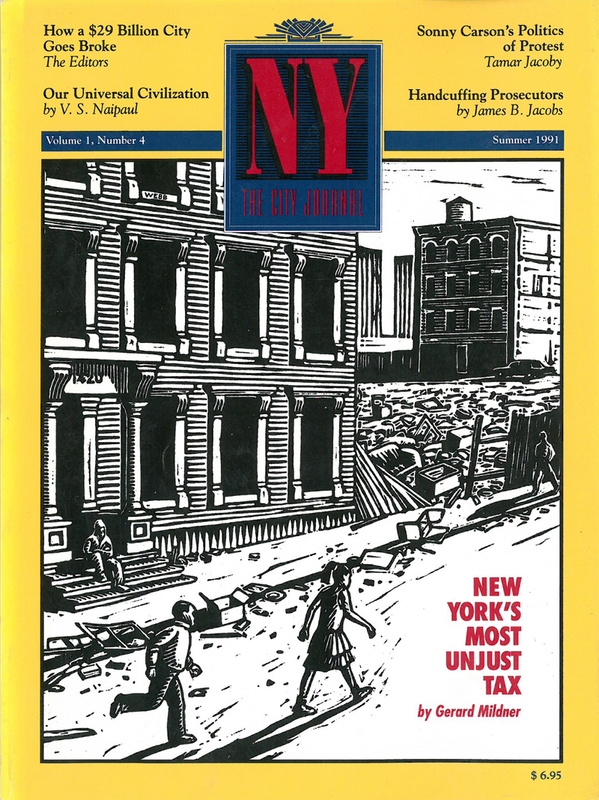 As long ago as 1938 the New York State Conference of Mayors and Municipal Officials asked a state constitutional convention to prohibit costly mandates unless the Legislature “either empowers the localities concerned to levy additional taxes, other than upon real estate, to defray these expenditures, or provides for a distribution to the localities of additional state funds.” The request was turned down; a 1967 constitutional convention likewise passed up 14 different mandate relief proposals. Thirteen states have tried a more effective approach: a constitutional provision limiting mandates, usually by forcing states to pay for programs they require, which establishes a direct link between the costs and benefits of government growth. Whenever the Legislature or any state agency mandates a new program or higher level of service in any local government, the state shall provide subvention of funds to reimburse such local government for the cost of such program or increased level of service. Since 1986, Comptroller Edward Regan, a former Erie County executive, has been urging a similar amendment for New York State. The Comptroller’s amendment would not go as far as California’s, simply prohibiting expansions of welfare and Medicaid or property tax exemptions unless the state reimburses localities for them. But existing mandate burdens would be left unaffected. The ultimate solution to the mandate problem would be to require the state to pay for any specific programs it puts into place. The wording of such a provision would have to exclude highly general requirements such as the obligation to provide public schooling through grade 12. But any state statutory mandate that shifts specific burdens onto localities or micromanages local governments into specific procedures should be paid for by the state. That would not only cut waste and mandated costs, it would also reduce the crushing burden of the state bureaucracy and leave local governments free to innovate. Spending would no longer be politically costless for state legislators and the Governor, since they would have to bear the onus of raising taxes as well as take credit for new programs. City and county governments, no longer burdened by state programs, would have the money to provide services their constituents really want. The result would be more accountable, more democratic, and less costly government throughout New York.